My guys in the shop have been cleaning dried glue from stave door cores for over 25+ years with a scraper bar. (See example picture - these cores have already been cleaned up). I have been trying to talk them into using the jointer or planer to do this work because it is faster and easier on the body. They say they want to save the knives in these machines. They also mention that they need at least one flat side before going through the planer anyway. What do other door makers do to get rid of extra glue off the stave cores before they glue on the face skins (veneers)? In my past experience working for commercial door companies, we always used a calibrating sander. We made (or bought) the core a little thick and sanded to final thickness after gluing the stiles & rails on. That also served to make sure we had a flat, flush surface to laminate the face and back to. We knock the big blobs off with a scraper then calibrate through the wide belt. I glued up on the thick side and calibrated going through the moulder hitting both faces. We will also put them through the molder using carbide heads, but often the molder is running trim when the door guys want "their" job done. Using the molder is better. We baby ours. After glue dries an hour or so we scrape the excess off and let them set at least overnight. We face one side on jointer and then run through the S4S machine to prepare for gluing the skins on. The S4S is a straightening moulder and 70% of the time facing is probably not needed but we do it anyway. We use TB3 (probably not the best glue for this because it is flexible) and it does not seem to hurt the knives. When using LVL cores we glue the edges on, flush trim and calibrate on the WBS using the head with a steel roller. Joe, you say "We use TB3 (probably not the best glue for this because it is flexible) and it does not seem to hurt the knives." Do you use TB3 because it does not hurt the knives, for its moisture resistance or for some other reason? What do you think the best glue would be? And do you use TB3 for edge gluing the staves as well as the edgeband in one step? We were getting ready to head out and I was typing fast. We use TB3 just because it is convenient and easy in a small shop. I have heard it has issues in hot climates but we have not experienced any here. Because TB3 is flexible and has creep you can put a stave core on its face side between 2 sawhorses and overnight it will bow down. Turn it the next day and it will go the other way. We have not had issues with this either but a rigid glue like Unibond will probably hold a stave core straighter. The one plus to using TB3 is that it does not seem to dull up knives very bad. We joint flat after glue up, with edges in place, then plane. We try to have enough thickness to go thru the planer twice - once on each face. TBIII looses about 60% of its strength at 170 degrees - more at higher temps. I have measured East facing dark finish door faces at 180 degrees, explaining why the panel joints failed. 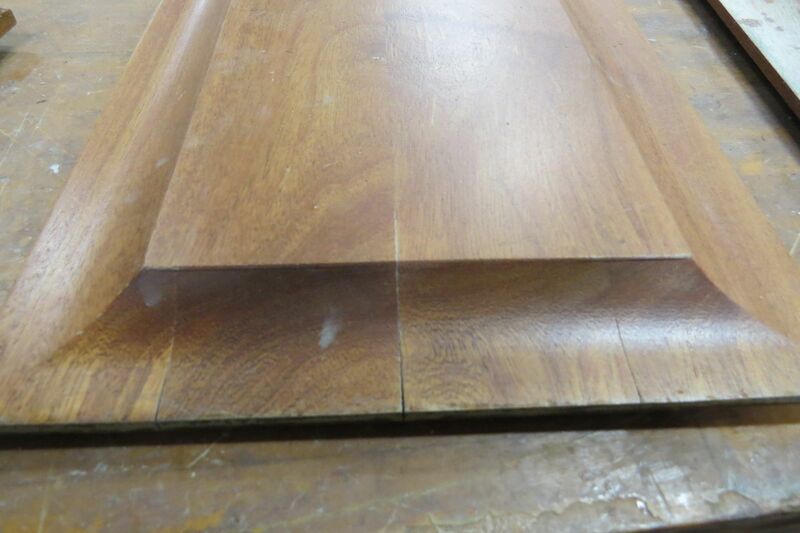 We even had a notable case where stave core doors made with TBIII on the staves came loose under 1/16" walnut faces that were adhered with plastic resin glue! The stave joints telegraphed thru the faces and we had to basically rebuild the doors. They faced East. We have changed to TBII as a result and have had no problems after almost a year. It is not like our doors are submerged. The temp/strength info came from a Titebond glue tech. He suggested we not use it as an aside to a conversation as to why we were having TBIII fail on W R Cedar assemblies (that is another story....). I have talked to others that have had TBIII failures that now appear to be heat related. Can anyone say "Class Action?" We use TBII on our door parts. We did try TBIII for a short stint - I was convinced it was a better glue due to it stating it was water proof. The guys in the shop were immediately turned off be the glue. We also discovered that it did not stand up as well. We had several glued up panels fall apart. 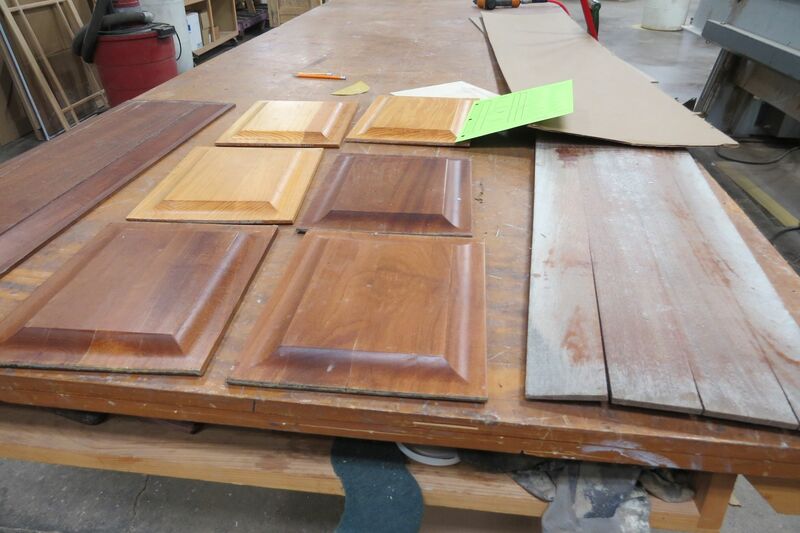 What type of glue (or process) do you use to glue-up your panels on your doors. We have a door coming up with some fairly large panels and are concerned with the glue lines showing and separating over time. We are making sure our moisture content in the panels is around 8 - 11%. I have attached a picture of a test that we completed on some panels we made and put outside for a year. The one on the far right was a panel that we put outside for over a year with no finish. Any advice from you to make sure the panels don't separate at the glue lines over the long haul? Is it the glue? Is it how the panel is glued up? I have never been a fan of T-3 due to its gooey character and poor performance at high temperatures (http://www.titebond.com/product.aspx?id=e8d40b45-0ab3-49f7-8a9c-b53970f736af). I will say the manufacturer clearly shows the weakening effect of high temps on this page although their marketing ignores it. I have used Titebond 2 successfully on a number of exterior applications, and as long as it doesn't stay wet it seems to perform well. I have gone to using it for most purposes to simplify ordering. Titebond 1 Extend has a role in complicated interior glueups. If Titebond 2 Extend didn't tend to separate out solid from fluid it would have a place on the shelf. My other standard is epoxy, but it too loses strength at high temps (better than T-3 though). I really don't care for the formaldehyde exposure with PPR glues and their limited shelf life, and they are not designed as exterior adhesives. Resorcinol is bulletproof but has an objectionable glueline as well as the minimum temperature requirement for curing (shared with PPR). What's a fellow to do? I guess I will continue to stick (pun intended) with T-2 for most processes and epoxy for final assembly of complicated doors due to the long assembly time and slipperiness. Having the glue seize up as I clamp a four panel door alone is not my idea of fun. 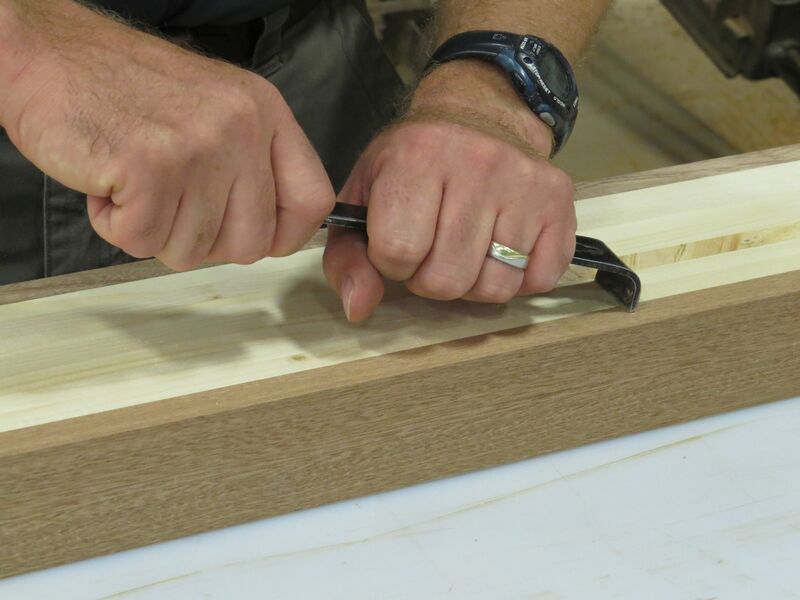 To the original question, when I was using stave core purchased in sheets we would rough out the parts, joint and thickness before applying edgebanding, trim flush, clean up the glue before curing and run through the widebelt. It would probably be more efficient to band then face and plane. Our planer (SCMI S52) had a very minor snipe so we always ran stock through the widebelt to eliminate that, plus the epoxy we used requires an 80# tooth for good adhesion. The bottom line is the parts should be flattened at some point prior to the faces being glued on. Most of the glue should be removed before that happens to minimize scarring the knives or fouling the wide belts, and that is most easily done before the glue fully cures. With pva's I like to let them set up until rubbery and clean up with a dull chisel. As to glued exterior panel longevity, I think the best bet is to use stable woods at the appropriate MC, seal the end grain well and keep it away from exposure to standing water in the rail grooves and maintain the finish. The cyclical exposure to rain, wind and sun on unfinished exposed end grain is going to overwhelm the best glued joint eventually. I would agree that TB3 is funny stuff. We stir the pails before using. I have noticed the color is a little different between batches. We used TB2 for years on doors with no issues also. I do like the 3 better for gluing skins on because it does not creep like 2 does. If you have side pressure this is not a issue. Big wide panels are dangerous. Even though it is said a good glue joint is as strong as T&G or shaped glue joint we always us T&G or glue joints made on our S4S machine for any exterior panels. I figure if they open a little at least you will not see daylight. We use back to back panels with insulation between when there is room. I believe that helps as well. i keep a 3 inch putty knive by glue up bench. i squegee glue smooth while wet. then hit glue right by clamps with chisel or pocket plane, flip and run thru planer. i use tb2 and plastic resin.